Premium Laser Tattoo Removal More Affordable Than Ever. As we head into Sydney’s colder months, it’s a perfect time to begin your journey back to clean skin. The cooler weather means there’s less chance you’ll be going out in the sun and it will be much easier to protect your treated tattoo from those harmful rays. Starting now, you’ll be well on the path to complete removal by next summer. With this in mind, a great way to budget those winter treatments is with our interest free repayment plans, starting from as little as $15 a week! Choosing this option means you can be treated right away, without worrying about the cost. Receive treatment now, pay later! How frequently the repayments are made is in your hands, with our weekly, fortnightly and monthly payment options. Be sure to ask during your free consultation. Here, we’ll determine your price per treatment and tailor your plan to suit your budget accordingly. Don’t forget, our everyday discount offers and customer rewards program can still be used when opting for an interest free repayment plan, making our premium laser tattoo removal service more affordable than ever. 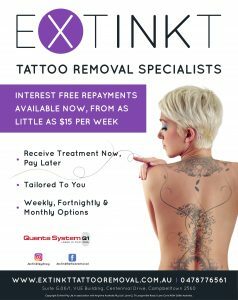 Extinkt Tattoo Removal Specialists are committed to maintaining our position as a leading provider of laser tattoo removal in Sydney. Head over to our Facebook page to keep up to date with our activity. Contact us to arrange your free consultation and begin your journey back to the clean skin you’ve been longing for.